Screencheat, the newest game by Samurai Punk, is a split-screen online and offline multiplayer FPS where you need to cheat to win. As of lately, the concept is hard to grasp for some since Screencheat is not a traditional FPS-game. Your enemies are invisible and thus you need to screencheat to pinpoint their location – a very nostalgic mechanic if you ask me. There is not much of a storyline in Screencheat. In fact, there is none at all and that’s great since a storyline wouldn’t even fit in the game. It wouldn’t do it any justice. Now you can purely focus on the chaotic FPS gameplay where it is allowed to cheat. In fact, the game encourages you to screen cheat via the split-screens. While Screencheat is an FPS, you shouldn’t expect to get some realistic graphics. In fact, the entire game is about the four basic colors: blue, red, yellow and purple. In certain maps red is replaced by green. The colors represent one section of the map and since you cannot see your opponents, roughly pinpointing where they are at is easier with the colored sections. The game does have a colorblind mode while can come in handy since the game relies heavily on the usage of colors. The maps are cleverly designed with a good variation of ground levels but none of them are truly polished. This isn’t something that is quite bothersome either since the game purely focuses on the fast-paced gameplay. Every map will have some details that make the map feel more polished but again, the game is not about being amazed by the visuals. All-in-all there are five maps to play in but all of the maps are distinctively different from the others, providing a good variation. The ambiance sound in Screencheat is some happy-go-lucky electronic soft dubstep sort of sound. Yes I know, it’s quite a long description but it’s quite hard to pinpoint what exactly the sound resembles. Other than that, each weapon – if you can call them weapons really – has a very distinctive sound. You’ll be able to hear loud bangs from the blunderbuss weapons or some very loud booms from the bear bombs. As for the gameplay in Screencheat – it is simple. You pick your weapon and try to aim at your opponent. There’s a catch however since your opponents are invisible! So, how do you know where your opponent is? Easy-peasy! As the title of the game suggests, you need to screencheat your way to victory. 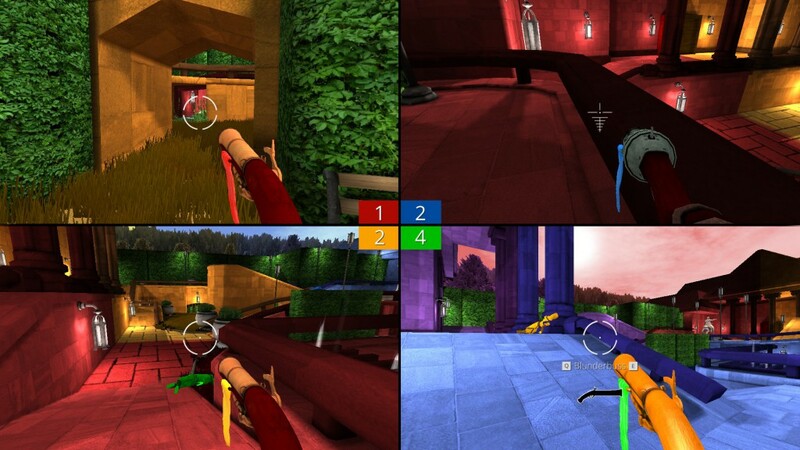 The game provides a split-screen so everyone can see where everyone is hiding out and the colored sections of the maps can help you locate your opponents more easily. Once you located an opponent, simply head to where they are at and ‘try’ to aim at them. A time limit and a score to win from one to fifty can be set once you’re in the lobby. Screencheat can be played with the traditional keyboard and mouse but it can also be played with the controller and both of these are quite flawless. You should be able to customize your controller bindings but since I played with the keyboard, I didn’t bother looking up on how to do so. Since the preview, there have been a few additions to the game: new maps, weapons and even game modes. As I mentioned before, there are now five maps – each very distinctive. There are now also eight weapons available. Some are quite overpowered, others are a blast to play with while some other weapons are just hilarious. How about killing someone with your hobbyhorse or a bear bomb? It can’t get more hilarious than this really. My favorite weapon remains to be the blunderbuss – especially since players who played Screencheat in Early Access now have a Golden skin for the blunderbuss. There’s also a crossbow and a Chefolet – although the last one is a very awkward beam-like weapon that’s just not up my alley. Lastly, there are now six game modes to enjoy yourself with, the typical FPS ones being My First Deathmatch, Hillcampers and One Shot. In hillcampers you need to stand and hold the hill while in one shot you can only reload once everyone has fired their weapon or when the timer runs out. 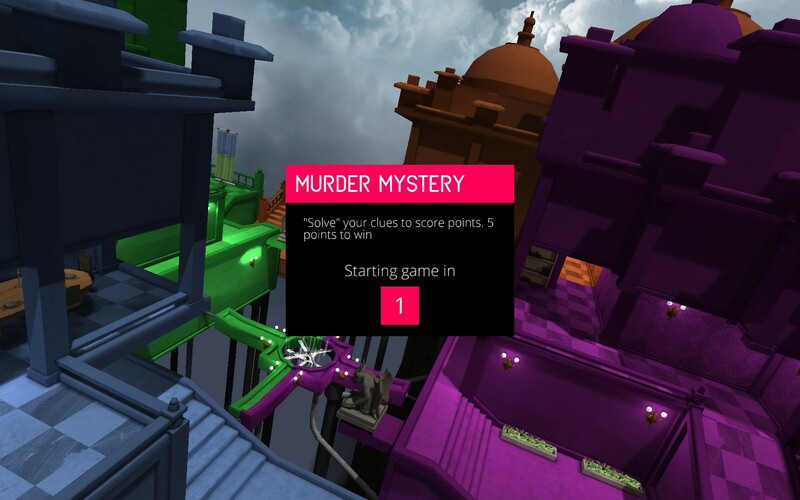 A few new fun additions are Murder Mystery, Capture the Fun and Party Mode. In Murder Mystery, the game picks out a target which you need to kill. You’ll have all information you need in order to succeed in your mission: which zone they are at and with which weapon they need to be killed. This is my least favorite mode since the game is fast-paced and this mode only ups the already large chaos. In CtF you’ll be holding on to the piñata as long as you can – much like capture the flag. The party mode is a mode that randomizes all gamemodes – great if you like surprises and don’t mind the modes. 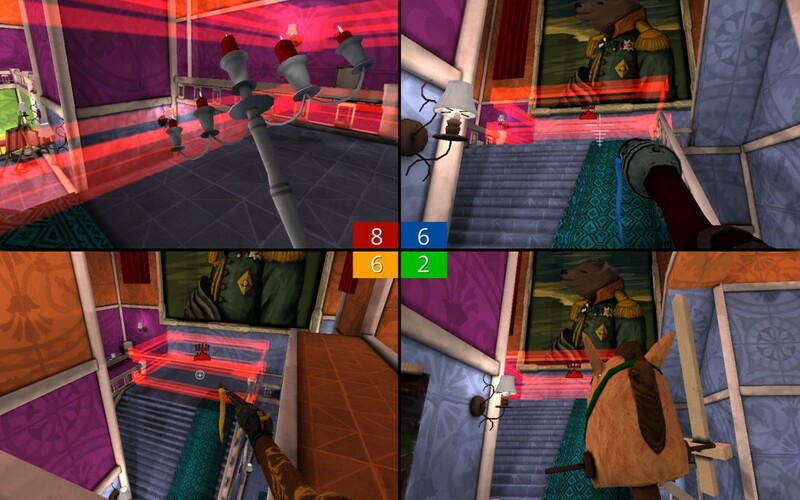 Not only does Screencheat have an online mode, you can also play it offline with up to four players in a local multiplayer game. A great party game in offline mode and a fun game during online games – although you’d need to ask some friends to join since the player base of Screencheat is incredibly low since launch. If you are looking for a fast-paced action game that is both hilarious and will test your skills, Screencheat is certainly something to look into. Although you may want to drag some friends with you since the player base has decreased a lot since launch. All-in-all, a great and fun concept that is nicely executed. However, with only five maps and six game modes, there is still enough room for more content to be added and hopefully the devs will continue to work on the game to make it even more brilliant.